Are you struggling to find the time to get to the gym this time of year? Are you traveling a lot during the holidays? Don’t stress, instead try this Bodyweight Pyramid Workout when you’re finding it difficult to get in to the gym this holiday season. To challenge yourself add progressions and limit rest time in between exercises; however its okay to modify all you want to make it fit your fitness level and rest when necessary. 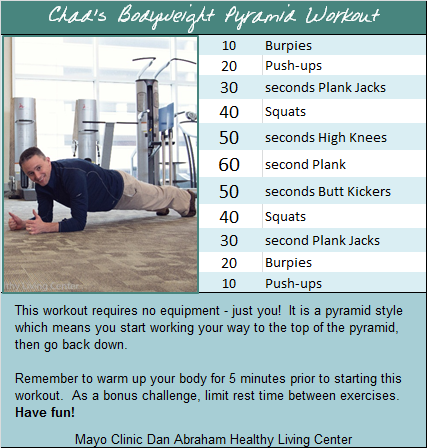 Remember to warm up your body for a few minutes prior to starting this workout.